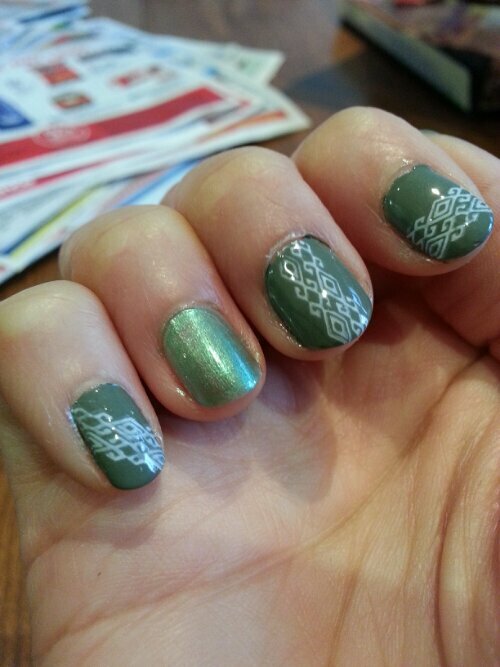 Nail stamping has been gaining popularity in the past year or so. Nail art has become all the rage. 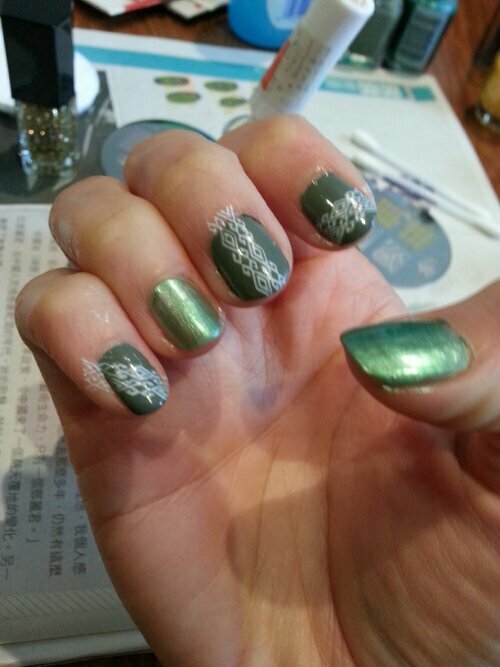 I surfed many nail blogs & YouTube videos to learn more about nail stamping. Then, I took the plunge. I bought myself the Konad Stamper & some plates from Konad & Bundle Monster . Overall, the Konad plates cost more, but they work 100% of the time. Bundle Monster has a wider variety of plates, but I’ve had some read duds. Either the etched design is too shallow or there was just too much space in the design, so the color never gets picked up. I think I’ll stick with Konad from now on. The price is worth the product working 100% of the time. Less frustrations & headaches from having to re-do your nails because the design didn’t get picked up properly. Your fingers should already have the base coat & color on it before you start. Make sure the color is completely dry before attempting to stamp, otherwise your color will get mushed up. 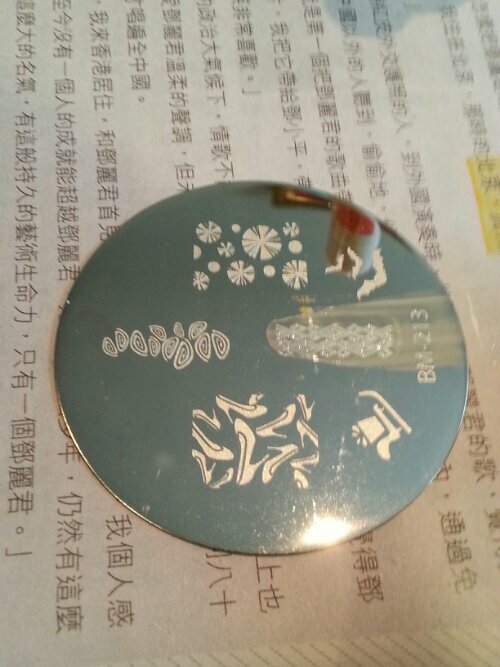 The idea behind nail stamping is to use your nail polish to fill the design etched into the plates (that’s a Bundle Monster BM-213 plate I’m using). Using either the squeegee supplied or an old plastic credit card, you swipe off the excess nail polish from the template. Make sure to use newpaper to protect your table. No one likes nail polish all over their wood/glass table. 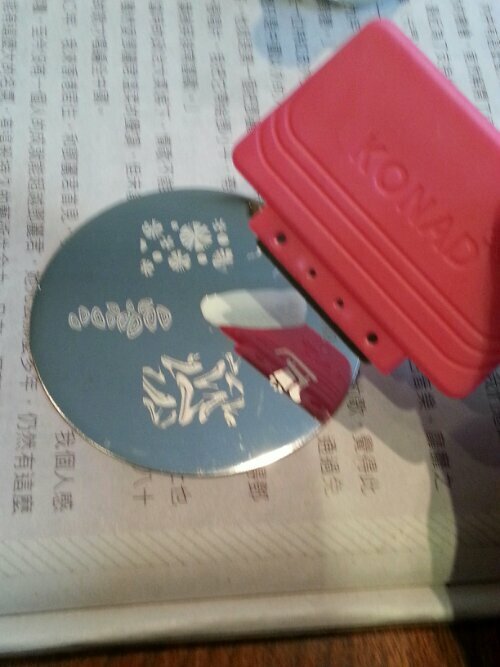 Then you take your Konad stamping tool with the rubbery end & roll it on top of the template to pull the design off. Now the design is attached to your tool. It looks pretty cool at this point. Quickly, but carefully, place the design on your nail & roll it from one end to the other & pull off. 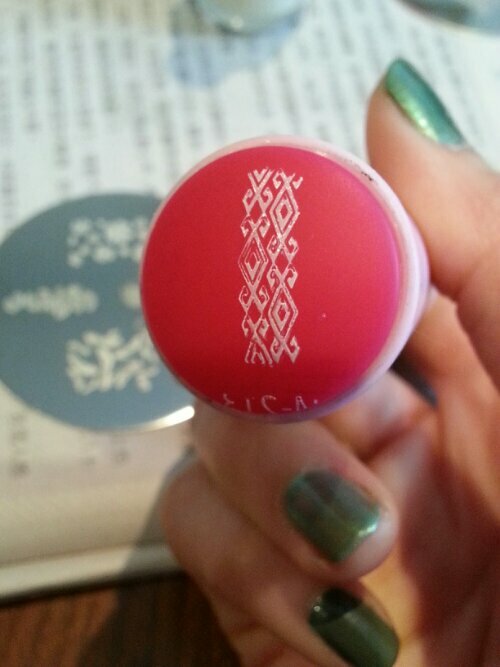 Magically, the design transfers onto your nail. 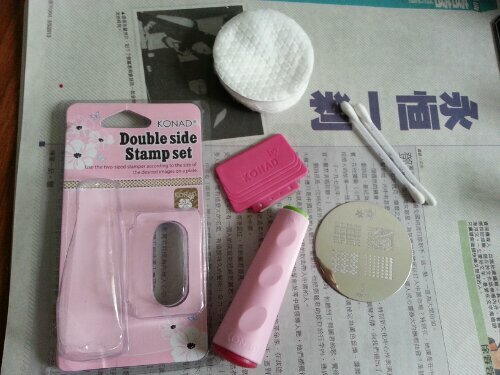 Clean the stamping tool with nail polish remover. And repeat the steps for your other nails. Using a cotton swab, clean off the edges. It comes off pretty easily. I put some flowers using the smaller end of the stamping tool onto my thumb. The flowers are from a Konad plate. This is such a fun & easy thing to do to liven up your nails. 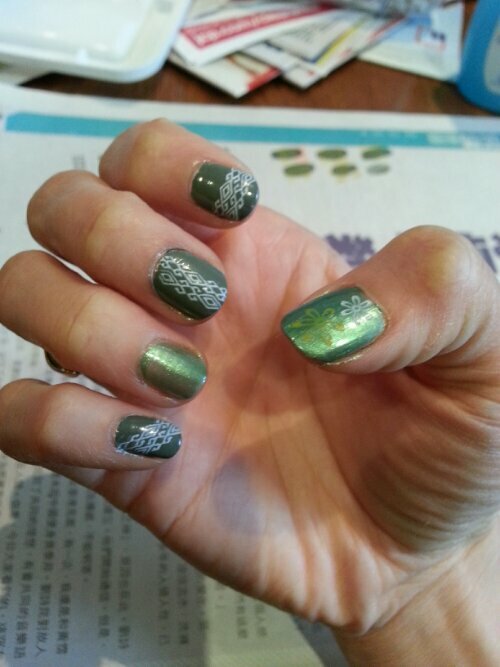 If you have old chipping nail polish, it’s the best time to experiment with stamping before you remove your polish. I’ve found old, thick, opaque nail polishes work best for stamping. 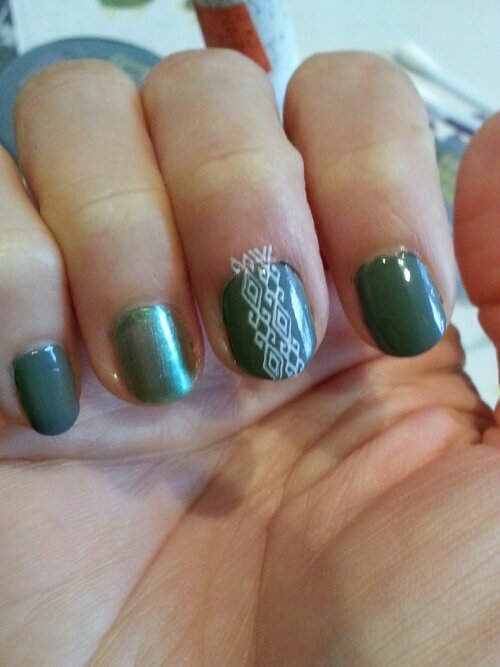 Putting a light base color with a darker stamping color makes the best contrast. The websites all tell you to buy their special stamping nail polishes, but I’ve read elsewhere many of the ones you already own work just as well. My Wet ‘n Wild White nail polish from over 15 years ago (bought at Caldors which closed down eons ago) works really well. This is a great way to use up all those old nail polishes that’s been sitting around. Have you tried nail stamping? What’s your favorite design? Happy stamping! 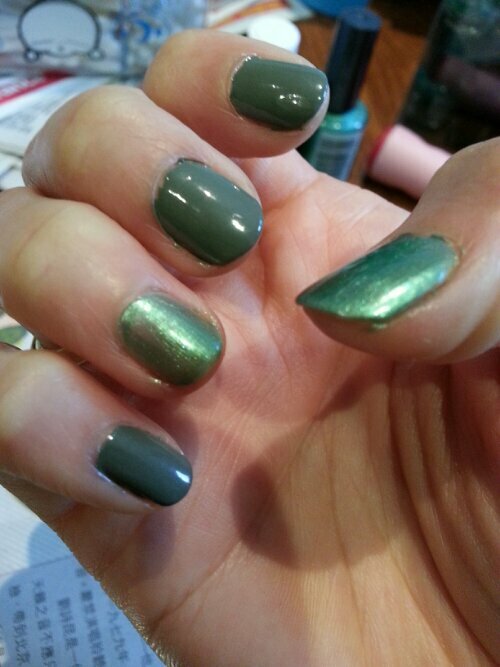 Nailtiques 1 – used as my base coat to help my nails get stronger. Here’s the larger bottle. Nailtiques 2 – you’ll use this every day for a few weeks for brittle nails to get stronger.